Many Arab tribes had helped the British against the Ottoman Empire during WWI in what is known as the Great Arab Revolt (when the stories Lawrence of Arabia took place). This revolt was led by the Hashemites, who at that time ruled over the Hijaz (the area surrounding Mecca and Medina). 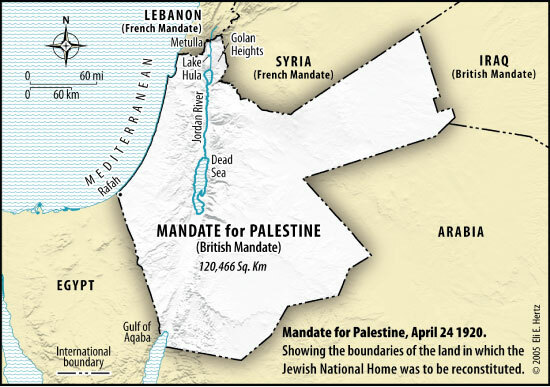 In 1922, 77% of Mandatory Palestine was cut off east of the Jordan River and given to the Hashemites in large part as compensation for their aid during WWI. 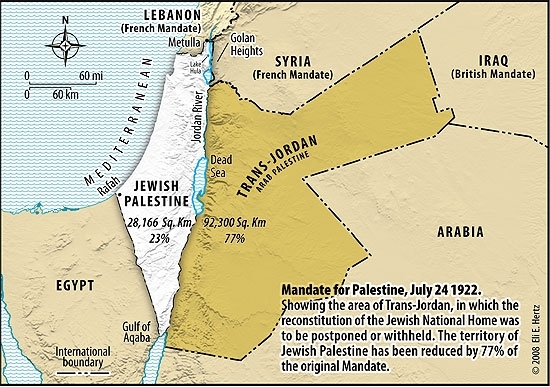 The area was given statehood (under a British Mandate), and labelled Transjordan, the pre-cursor of modern day Jordan (still under Hashemite rule). See Map 2 for an illustration of the split. When Transjordan split, the new state was excluded from any provisions dealing with Jewish settlement. To this day a significant number of Jordanians label themselves Palestinians (some say up to two-thirds, while the US State Department says more than one half), although this has a lot to do with Jordan’s 1948-1967 control of the West Bank. For the sake of brevity I will only be focusing on the other 23% of Mandatory Palestine, but I welcome any additional content on this matter (comment below). The question of why Palestinian nationalism became more prominent than the pan-Arab variety is still debated. I do not pretend to know exactly what caused it, so instead I will provide three important factors, and will not conclude on which played the biggest or smallest role (I’ll leave that to the reader). The two most commonly cited and easiest to understand reasons are anti-Zionism and anti-Imperialism (first Ottoman, then British). The issue of Zionism is unique to Palestine, even if anti-Imperialism is not, and the argument is simply that opposition to these external forces solidified a sense of being ‘Palestinian,’ as opposed to Arab in general. The third factor I will cite is the setbacks of pan-Arab nationalism in Syria, which led to Palestinian disillusionment with the concept. After WWI, the Hashemite King Faisal, had been attempting to create a pan-Arab state out of the ruins the Ottoman Empire’s Arab territories in present-day Iraq, Syria, and the rest of the Levant. At this time, many Palestinians viewed themselves as part of the greater pan-Arab cause and were generally viewed from an Arab perspective as ‘Southern Syrians’. Despite Faisal’s efforts, the various factions in his government began to fragment. It is suggested that Palestinian elites began to feel overlooked in Damascus, and that Palestinian issues (especially Zionism) were not being given the attention they deserved. Such neglect led to a ‘provincializing’ of the nationalist cause. I should note that Arab nationalism did come into power over the next several decades all over the Arab world, but that topic is out of the scope of this discussion. Overall, it would be irresponsible to conclude the ‘truest’ or ‘most important’ factor is any one of the three I have presented. It is likely that the combination of all three factors, along with others that remain unsaid, influenced the growing pre-eminence of Palestinian nationalism. Therefore, the rest of the post will focus on a chronology of the important events that contributed to its successes and failures. The British continued to view the Ayan and the wealthy Christian community as the natural Palestinian leaders in the way their Ottoman predecessors did. The Ayan often played both sides by seeming to support the goals of both the British and the fellaheen at various times. One significant area of agreement between the Ayan and the fellaheen was resistance to Zionism. Since the Ayan were the leading figures opposing Zionism, the fellaheen viewed them as protectors, and the most capable of effectively stopping the flow of incoming Jews. To many Arabs, Zionism was seen as a derivative of British Imperialism (a feeling that lingers to this day), so while the emphasis was often anti-Zionism, an undertone of resistance to the British was always present. Many viewed political unity with Syria as the best defence, but politicians in Damascus were more concerned with their own issues than resisting the Zionists and British in Palestine. In 1919, Faisal made an agreement with Chaim Weizmann (President of the World Zionist Organization) accepting the idea of a Jewish State in Palestine, further angering Palestinian leaders. By 1920, the French had kicked Faisal out of Syria, and while many Palestinians still clung to the hope of pan-Arab nationalism, Palestinian nationalism began to overtake its popularity (keep in mind that the two are not necessarily mutually exclusive). A growing Arab intelligencia began to form around the idea of Palestinian nationalism. While the concept was initially one of the upper class, it eventually started to catch on with others. Ironically, it was the British education system that helped enormously with the diffusion to the countryside. This is because the system was based on young educated urbanites teaching rural Palestinians. Muslim-Christian associations began to spring up and would commonly highlight the differences between both non-Arab Palestinians and non-Palestinian Arabs. This aided the burgeoning Palestinian identity, separating it from both Palestinian Jews and other Arabs. Despite these gains, the Palestinian nationalist movement was fragmented, weak, and made up more of people with the same enemy than with the same goals. There was major disagreement on what a Palestinian society should look like. In contrast to the Ayan, the fellaheen and disenfranchised city workers opposed to the idea of the city being the future model of society. City life was viewed as unattainable to the poor, and highly influenced by the west. Jaffa and the coastal cities came to be seen as Jewish collaborators. In 1923, strain on the relationship blossomed over the decision of whether to source power from Jewish built and managed plants. In the meantime, Arab banks attempted to loan fellaheen enough money to prevent them from selling land to Jews. It was during this time that poetry became an important artistic outlet for nationalist feelings, with common theme being soil, Palestinian soil (something that endures to this day, see my post about the Hamas Charter for an example). Eventually Arab-Jewish tensions superseded the Arab community’s lack of unity and they lashed out. Two large revolts were to characterize the next decade and rouse Palestinian nationalism to levels previously unseen. In August 1929, the Arab community began a mass riot fuelled by ongoing disputes over access to the Western Wall for Jews in Jerusalem. During the week of riots Arabs killed 133 Jews and injured 339, while also destroying significant amounts of Jewish property. While attempting to put down the riots, the British killed 110 Arabs and injured 232. The British inquiry into the riots (the Shaw Commission) found that the fundamental cause of the violence “without which in our opinion disturbances either would not occurred or would not have been little more than a local riot, is the Arab feeling of animosity and hostility towards the Jews consequent upon the disappointment of their political and national aspirations and fear for their economic future.” (Kimmerling 71). Despite this show of unity in 1929, rifts between the Ayan and the others quickly resurfaced. The Istiqlal Party gained popularity with an anti-British focus and they, like the Ayan, wanted to create a secular Palestine. 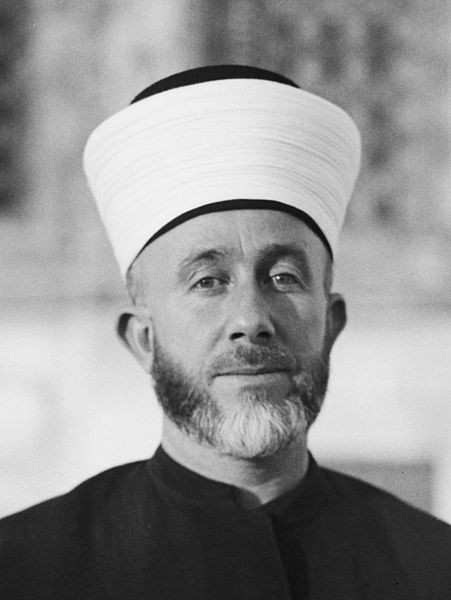 Others like Haj Amin al-Husseini, the Mufti of Jerusalem, felt differently. The issue of religion was considerable given that a great many PalestinianArabs were Christians. For the next few years, the various factions had frequent disputes along with the customary accusations of collaboration with the British. Meanwhile, a leading sheikh named Izz ad-Din al-Qassam who travelled Palestine professing jihad against the British and Zionists, grew rapidly in popularity. He had a Jewish British constable assassinated, and after a large manhunt was surrounded and killed in the ensuing shootout with British police. Qassam became a unifying figure for the Palestinian Arabs and the first martyr of the Palestinian cause. His legacy is powerful to this day, as the military wing of Hamas is named after him. In April of 1936, a mass Palestinian strike against British rule and Jewish immigration began in Nablus and expanded to cover several Palestinian cities. 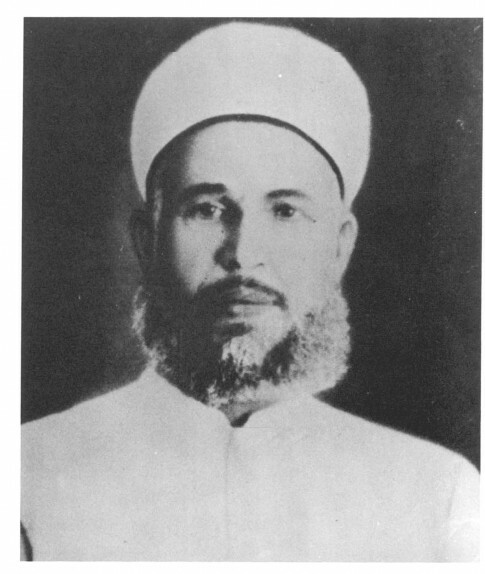 The newly established Higher Arab Committee, led by al-Husseini (now Grand Mufti), organized the escalating revolt. The British created the Peel Commission to make recommendations concerning the strike, and it arrived in Palestine in November 1936. In July of 1937, the commission’s report suggested a partition of Palestine between a Jewish and Arab state (See Map 3 below), the maintenance of a British controlled area between Jaffa and Jerusalem, and a transfer of populations (to be modeled on the 1923 transfer between Greece and Turkey). The Palestinians, including al-Husseini, flatly rejected the idea of any Jewish State, and therefore rejected the recommendations of the commission entirely. The Zionists accepted the concept in principle, but wanted to negotiate the details. During the first stage of the revolt, many of those revolting were Ayan who had been part of the clubs and associations that helped to organize it. The British suppressed the revolt heavy handedly, arresting many, and destroying much of the Ayan class. In September of 1937, a Zionist-sympathizing Brit named Lewis Andrews was assassinated by al-Husseini causing him to lose British support entirely and flee to Lebanon. By the end of 1937, the fellaheen began joining the revolt en masse. What began as striking and flashes of violence, turned into a full out armed revolt. Nablus, Hebron, Bethlehem, and Ramallah were all overrun by the rebels, and many Jews in those cities were massacred. While the British were able to maintain their positions in most cities, the entire Palestinian countryside was only nominally under their control. However, the infamous disunity of the Palestinian cause reared its ugly head once more. Differences between the old aristocratic urban leadership and the localized rebel bands grew rapidly. What remained of the nationalist movement’s leadership was in exile, making unity and organization difficult. The rural rebels were not part of clubs or associations like those that organized the revolt. Instead, they were organized in traditional, tribal fashion. Fighting bands largely consisted of family members and trusted individuals. The rural rebels began to tax the urban class to fund the continuing revolt, with those who refused being beaten and sometimes killed. The Christians were especially targeted, since they were seen as wealthy and collaborators. The rural rebels ordered that urbanites (especially Christians) wear keffiyehs, a peasant’s garment, instead of the upper class fez or tarbush. This added to the urbanites feeling that the rebels were trying to reduce the cities to village life. 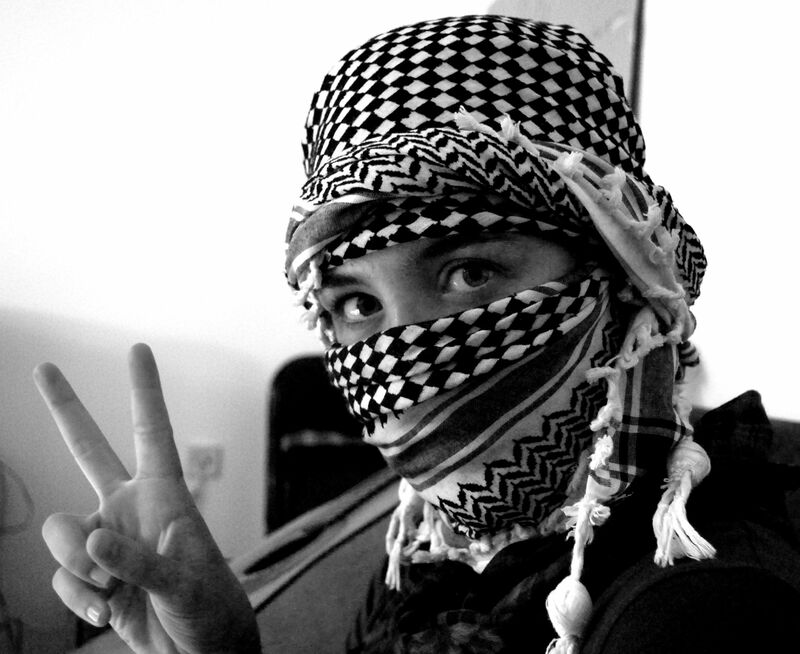 For this reason, the keffiyeh was discarded by the upper class until the 1960’s when it again became a Palestinian symbol (something that remains to this day). These issues resulted in many of the urban class fleeing to other Arab or European countries, many ending up in Beirut. 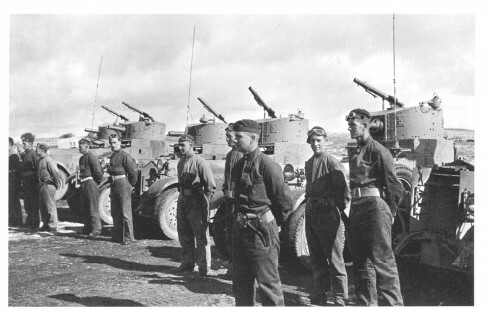 By 1938, the British had brought in another 25,000 troops to help push the rebels out of the cities. As the conflict heated up, the Zionist policy of Havlagah (self-restraint) became untenable and the British government began working in concert with the Zionists against Arab attacks. The British also managed to fuel the factionalism of the rebels, and indeed many of the tribes turned on one another. In several cases, assassinations and battles between different tribes were continuations of old feuds that had nothing to do with the revolt itself. One of the most powerful tribes (and already no friend of al-Husseini) named the Nashashibi’s was convinced to support the British, and others followed. Paralleling the revolt against the Egyptians (see Part 3), in the end it was the Palestinians themselves who helped quell the revolt in the hill towns of Palestine. As would be expected, the revolt put significantly more strain on the relationship between Arabs and Jews. By the end of the revolt, the Jewish and Arab economies had separated to a much greater and inevitably irredeemable degree. By the end of the revolt in 1939, the population of Palestine was now 30% Jewish. In the revolt’s aftermath, the British came out with the 1939 White Paper, which rejected the idea of partition in favour of ‘communal organization.’ This would also involve heavily limiting Jewish immigration to Palestine and banned the sale of land to Jews. However, these recommendations were never implemented, since the Jews wanted equal representation, while the Arabs demanded majority rule. While the revolt failed overall, and left the Palestinian national movement weak, fragmented, and disorganized, it also solidified the foundation of the movement itself. It left Palestinians with heroes and martyrs, and a popular culture to eulogize them. It reinforced the one unifying issue, opposition to Zionism. In essence, it created the Palestinian nation, while also crippling its political basis. Starting from this point, Part 6 will take us through World War II, then conclude ‘Who Are the Palestinians’ where the story normally begins; on March 14, 1948. Also thanks to my friend Lars who consistently challenges my research (and my opinions), improving the quality of my work. « Relativist Alert: Barbarity of Honour Killings Questioned?